I colored in the Whiff of Joy stamp using copics (Dress: R22, R39, and R27; Hair: E23, E53, and E25). The papers in the background were from Prima's Madeline collection, and the ribbons in the background were leftover stash items. In order to get the "strands" of hair look using copics, be sure to use a flicking motion with your markers and don't be afraid to layer colors. I started with the Raw Silk (E53) to get the base highlight color and then added in browns to create contrast. 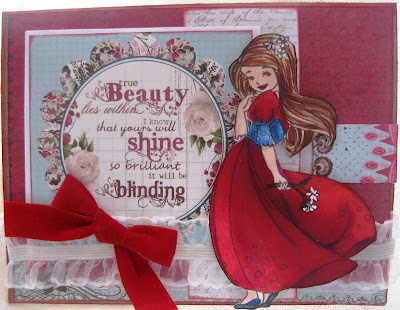 The shadows on the red dress were lots of fun to create as well using tip-to-tip blending and lots of R39 for deeper shadows.